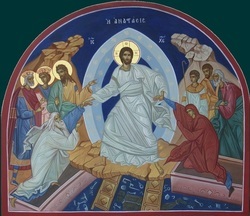 Greetings brothers and sisters in Our Risen Lord! Alleluia, a word sang in all ages since the Resurrection! We sing it with great joy even today at mass and most especially during the Easter Season and Christmas Season. Alleluia, a word that brings joy to people's hearts! Alleluia, even the heavenly choirs sing it! This Easter Season, I would like to challenge ourselves to do some worthwhile activities. Not that we do not do anything worthwhile right now, but I want us to do more for the community, not just the parish community but the Columbus/Franklin County community. If we need to work hand in hand with other Young Adult Groups so be it. If we need to work with other faith groups, so be it! Look around our community. There are probably a lot of things that we need to do to help make Columbus a great city and a great community that helps each other. I want to ask you to take some time and reflect on projects that you or that the group can work together to build peace, justice, feed the poor, clothe the naked, visit those that are in jail and/or the sick, or plainly lend a helping hand. Feel free to propose such work through our email address - yagroup.stjosephcathedral@gmail.com - or feel free to send me a text message asking for a few minutes of my time to meet up for a drink to discuss the project. We need your talents, skills and ideas for this to happen. That's the spirit of the Easter joy! We need to bring the good news to those who are in need of a new life, of hope, of great joy! Secondly, I want ourselves to increase our prayer life. There are so many opportunities out there to do them! I have suggested numerous ways on our website and I hope that you would utilize them! The Office of the Readings or Liturgy of the Hours is one of them. I use it every time I drive back and forth to work on my smart phone. You can even recite the rosary! Go visit a church nearby or by your neighborhood and offer even 15 minutes of your time to visit the Blessed Sacrament. Attend daily mass, if you are able. Read up on the Lectio Divina provided in the bulletin and reflect on the daily Gospel! Only you and our Father in heaven would know how much we pray. Nobody else needs to know that you do these. But I need to challenge you to arouse your soul to do it! Prayer time helps us to calm down, to rethink big decisions, to help refocus on our work and on our life, and to avoid the temptations that leads us to sin. Try it, I say, try it! You don't lose anything, in fact you gain your salvation towards heaven! Pray for our priests, especially for the Bishop and Fr. Mike who now run the Cathedral masses and to the other priests who give their time to help them say mass. Lastly, I want us to increase in number at our events. I want us to show that we are all in it together! In Salsa dancing or in Eucharistic Adoration, in making sandwiches for St. Lawrence Haven to helping clean the furniture at the Cathedral, we show our support for each other, let us show it at all of the events that we schedule throughout the year!